[SatNews] Blue Canyon Technologies (BCT) has been awarded a contract to build, test, and operate a new high-performance nano-satellite. BCT will be building this spacecraft for the Radiometer Assessment using Vertically Aligned Nanotubes (RAVAN) project, which is led by the Johns Hopkins University Applied Physics Laboratory (JHU/APL), with partners L-1 Standards and Technology, Inc. and Draper Laboratory, and funded by NASA’s Earth Science Technology Office. BCT will integrate the RAVAN payload with the XB1 Spacecraft Bus and perform environmental testing of the complete spacecraft. BCT will also provide launch integration services and operate the spacecraft from its new Mission Operations Center. 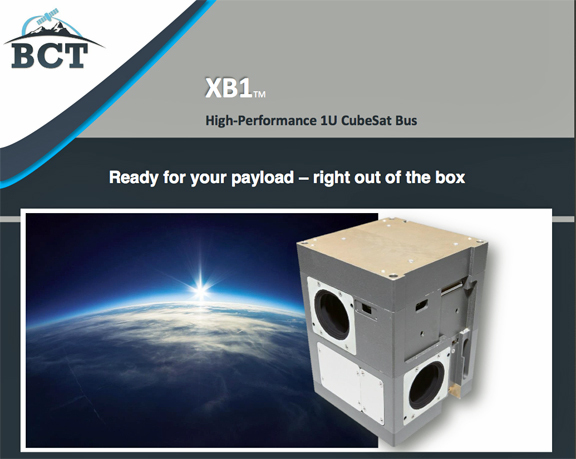 BCT’s spacecraft, the XB1, is a high-performance CubeSat that includes an ultra-precise attitude control system that allows for accurate knowledge and fine-pointing of the satellite payload. 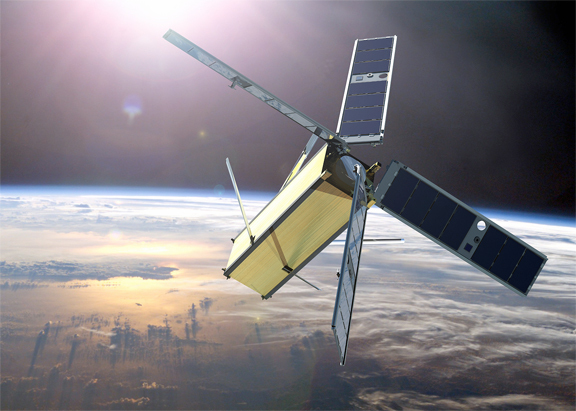 Artist rendering of the Radiometer Assessment using Vertically Aligned Nanotubes (RAVAN) satellite, a new, low-cost cubesat mission led by the Johns Hopkins Applied Physics Laboratory in Laurel, Maryland. RAVAN will demonstrate technology needed to measure the absolute imbalance in the Earth's radiation budget for the first time; the cubesat is scheduled for launch in 2015. The objective of the RAVAN project is to demonstrate a radiometer that is compact, low-cost, and low-uncertainty. The radiometer uses a gallium fixed-point black body as a built-in calibration source and a vertically aligned carbon nanotube (VACNT) absorber. VACNTs are the blackest known substance. Neither the VACNT nor gallium black body has ever been used in an orbiting scientific instrument. Successful demonstration will pave the way for a constellation Earth radiation budget mission that can provide valuable measurements needed to significantly advance our understanding of ongoing and future climate change. The RAVAN mission is expected to launch in mid-2016. “BCT has created a low-cost, Complete Small Spacecraft Solution that allows customers like APL to focus its resources on the mission science,” said George Stafford, BCT president. The BCT XB1 spacecraft will be developed and operated at BCT’s new 18,000 square foot facility located in Boulder, CO. BCT’s new office and lab space is designed specifically for high volume production of spacecraft systems and components, with the manufacturing capability to handle large constellations of small spacecraft.